Growing up, we used to have this delicious dessert called "Pink Stuff" that my Aunt brought to holidays. We kids ate this stuff up, literally. I set out to find a copy cat recipe and realized, thanks to Pinterest, that the formal name for this dish is Ambrosia Salad. I've also seen it called Angel Fluff Salad. Call it whatever you want, it's quite tasty. I like this dessert because, compared to most desserts, it's much better for you. It's mostly fruit and Cool Whip, so I didn't feel guilty about indulging in a bowl or two. Also, this dish is so easy a monkey could do it. It's literally just dumping ingredients into a bowl and stirring them together. It doesn't get much better than that! 1. In a large serving bowl, fold sour cream into Cool Whip. 2. Stir in remaining ingredients and store in the refrigerator until ready to serve. This looks delicious! Definitely saving this! 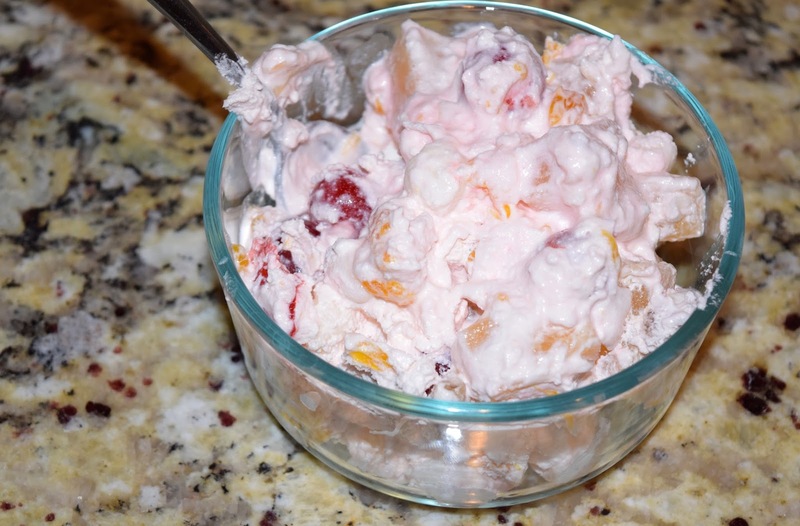 I've never had ambrosia salad before, I may have to try it. This stuff is amazing! My grandma used to make it. I thought our family was the only family on earth who even heard of this stuff. So glad you love Ambrosia salad too! I LOVE THIS STUFF! I never realized there was sour cream in it though.